A Credit is a Refund with no original Transaction ID. The lack of a Transaction ID means all card holder details will be required to process the Credit. Step 1: Choose Credit from the Payments menu. Step 2: Select the Merchant Account. Step 3: Enter the Billing Information. Step 4: Enter the Billing Address. Step 6: Enter Shipping Address (Optional). Tip: Credits do not require a Shipping Address. Merchants may choose to enter this data if they are using third party systems that receive data from this gateway. Step 7: Complete the Custom Fields (Optional). 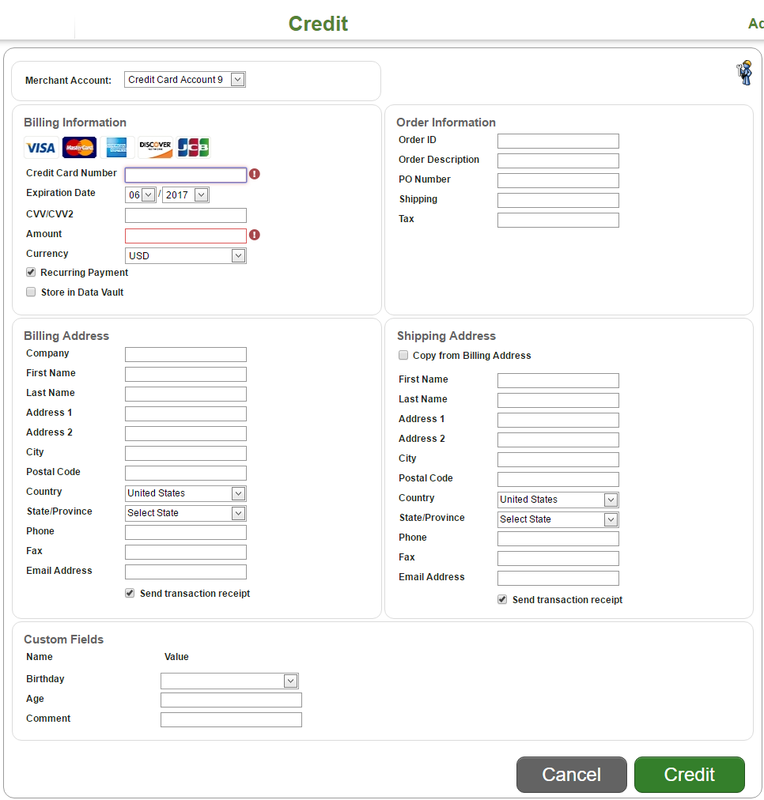 Step 8: Complete the Customer Information (Optional - available only for some payment processors). Step 9: Click the Credit button. When you click the Credit button money will be drawn from the Merchant bank account and credited to the customer’s card. The transaction type will be posted as Credit and the status will be Approved, assuming the transaction processes normally.